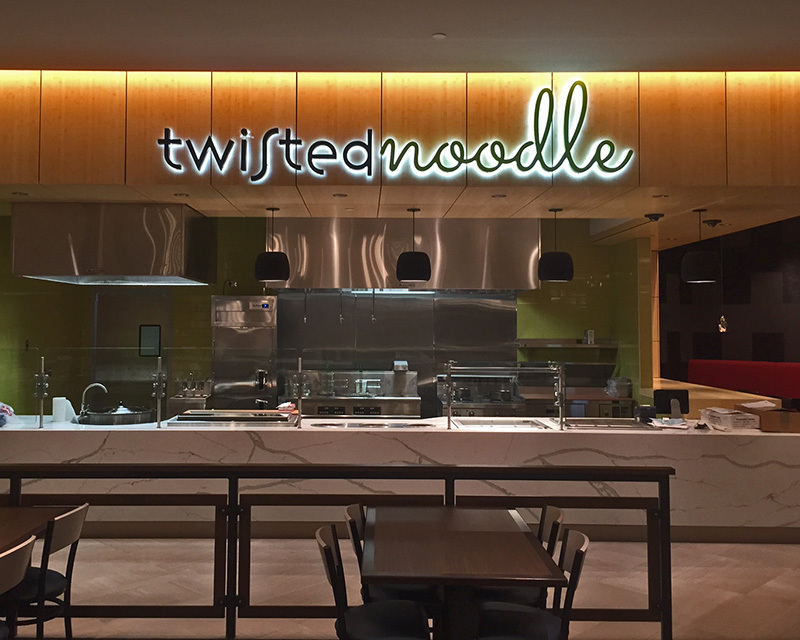 Create a dramatic halo lighting effect with LED illuminated signs for a unique, eye-catching look that elevates the perceived value of both the sign and your business. Sometimes referred to as “reverse channel letters,” our halo illuminated letters are professionally crafted using aluminum, stainless-steel or other fine metals and finished with a light accent. State of the art manufacturing techniques along with superior craftsmanship combine to make the industry’s finest halo illuminated signs. During installation, the letters are floated off the wall with spacers — and results are breathtaking, both indoors and outside. The light is directed against a surface behind the letter, producing a halo effect. The interior lights are generally LEDs, which not only shine bright and look nice, but the energy-efficient bulbs also provide cost-savings over other types of lighting. The LED (and therefore the halo color) is typically white, but other colors are available depending on your organization’s branding. When added to a letter with a non-illuminated face, halo illumination brings clarity and definition to the letter. But since halo illuminated letters and logos are usually illuminated only around the edges, you should consider how graphics will be seen when the sign is lit. Multicolor graphics on the letter and logo faces might require a combination of halo and face lighting. When you’re considering halo illuminated signage, you also want to think about where you’d like the custom sign to be located. Since it’s projecting light behind each letter, halo lit signage works best when installed on a flat surface (usually the side of a building). That being said, if you find yourself with no choice but to install the sign on an uneven wall, we can work with you to design a backer panel in order to provide a flat surface for the sign lighting to project onto. Plus, the color and texture of the surface it’s being mounted on could impact the way your sign looks once it’s installed. Don’t forget to take that into account when you’re designing your custom halo illuminated sign. Before you choose a custom halo illuminated sign, keep in mind that you’ll need an electrical junction behind the wall or in the ceiling above. Traditionally, halo illuminated signs are built to be mounted directly to your store front, with electrical wiring going into the wall behind each letter. However, halo letters can also be installed on panels, which is a great solution when accessing the wires is difficult or the wall surface isn’t flat. This way, you only need a single electrical junction to for connection. 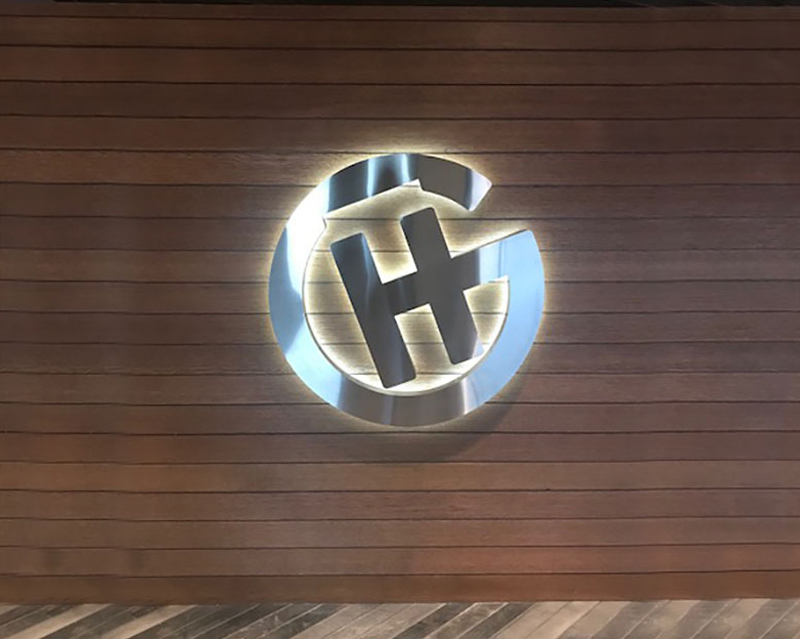 Generally, people consider halo illuminated signs for the outside of the building, but they’re becoming increasingly common as a signage solution for interior lobbies and conference rooms. Think about the brand boost and name recall for your business when your interior sign matches the exterior halo illuminated product! These guys did the signage for my chiropractic office in Elk River and they do outstanding work. Timely with everything and genuine. Their signs are high quality as well as affordable! I most definitely would go with them again if needed in the future. I highly recommend them.